Server makes your device discoverable from any other device running GoodSync Connect. App registers your device in GoodSync Connect network and serves file from your device to GoodSync Connect desktops and devices. Explorer allows you to Explore of any remote computer running GoodSync Connect. Explorer can copy (download / upload) files and folders between local device and remote device. Connect from GoodSync or GS Explorer running on any desktop computer to your iOS device. Sync files between a desktop computer and your iOS device. 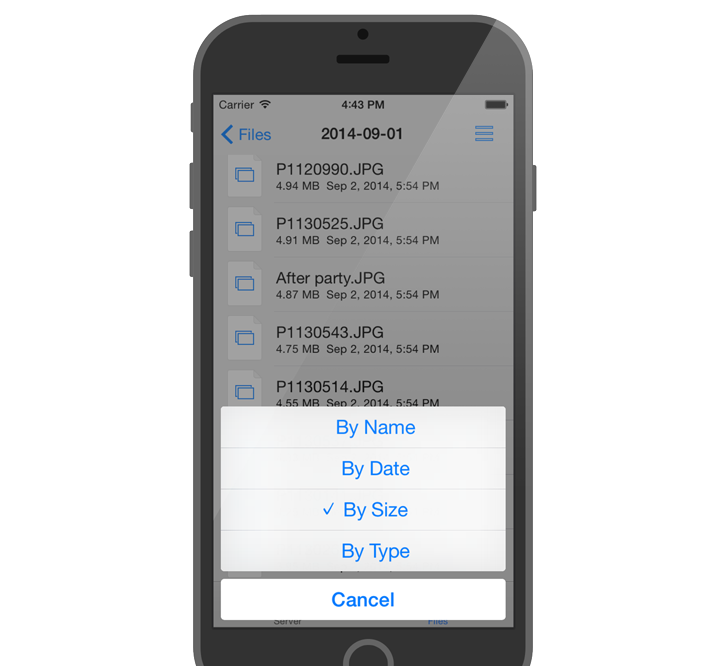 Order files by Name, Date, Size, or Type. Upload or download files to/from your computer to your iOS device. If you connect on the local network, then you will get local network speed when syncicng. Sync your Photo Albums to desktop (1-way sync only, since Photos are read-only). 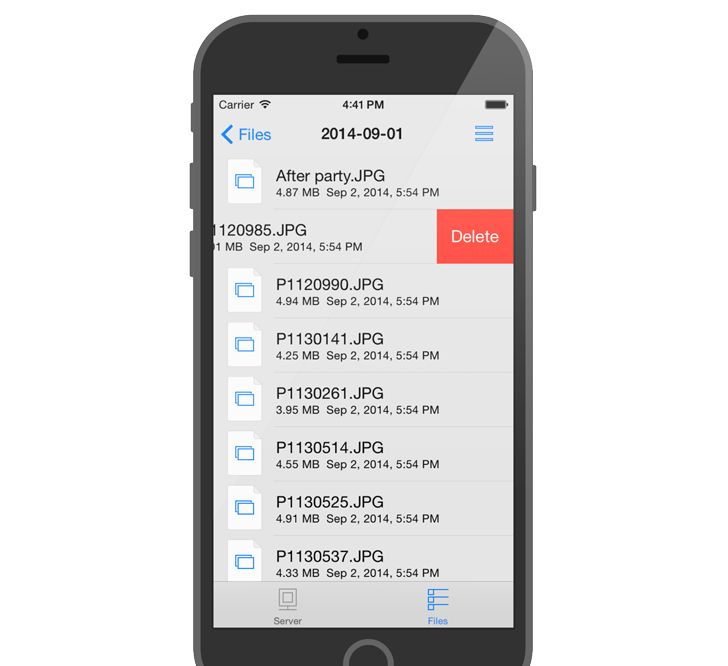 View Files from anywhere in GoodSync Connect network -- click Files button. In the App Store, search for GoodSync and install GoodSync Server on your device. 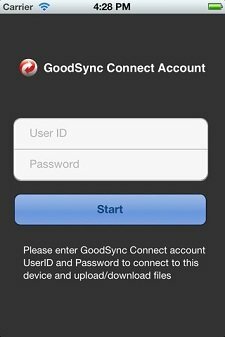 Provide your GoodSync Connect credentials when the GoodSync Server starts up so your GoodSync desktop application can find your iOS device (more about GoodSync Connect). Proceed to your desktop and list GoodSync Connect computers in GoodSync or GoodSync Explorer. Your iOS device will appear. You can sync with it, download files from it and upload files to it. You can also rename, delete and copy files and folders. 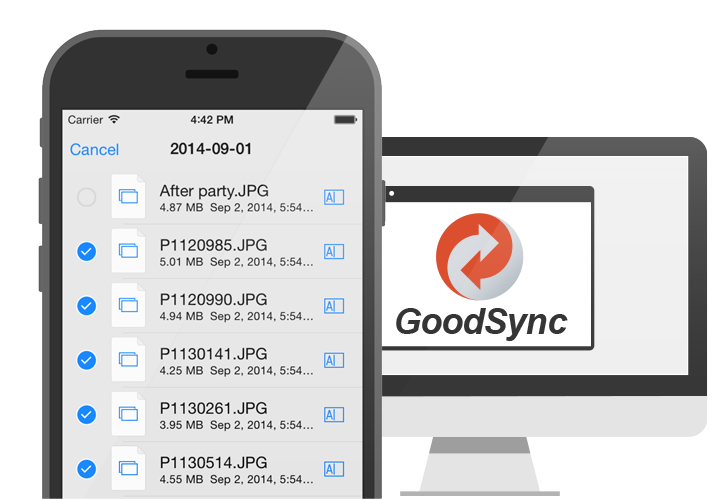 A: GoodSync Server for iOS is free for personal or non-profit use on your iOS device. In order to connect to it, you will need GoodSync for Windows or Mac, either the Free or Pro version. Q: Will it consume cellular bandwidth? A: Yes, if you are connected to a cellular data network, then you will consume bandwidth and might get charged by your wireless provider. Only run GoodSync Server when you are connected to via WiFi or meter your mobile data consumption. Q: Do I really need a GoodSync Connect account? A: Yes, you do. Don't worry, your files never make it to our servers, they are transferred directly between your computers/devices. GS Connect account is used only so that your computers/devices can find each other on the Internet. Q: I get 'cannot write' errors when syncing Photo Albums? A: Yes, you do because Photo Albums are read-only to GoodSync Server app. In GoodSync on desktop go to Options -> Right side (asuming your IOS device is on the right side) and check 'No GsData here' option. Click here for Version News.